15 month ago I joined the British platform Seedrs and started to invest in startups I consider interesting. Since then I have built my small portfolio, holding equity stakes in more than a dozen mostly British companies. In this article I share my experiences in the process. On Seedrs startups can pitch to raise money offering investors an equity stake in the company. This is called p2p equity or equity crowdfunding. The startup discloses information about their product, plans (e.g. intended impact, monetisation strategy, use of proceed) and achievements so far to registered users. There is further information about the market they operate in and the team is presented. The equity share offered is stated (e.g. 5%). This and the amount to be raised (e.g. 75,000 GBP) define the valuation of the startup that the startup has applied (in this example 1,425,000 pre-money, so post-money, that is after completed funding the startup’s valuation would be 1,500,000 GBP and the 5% equity share of the new investors represent 5% of 1,500,000 = 75,000 GBP raised). Note that the valuation is based solely on what the startup deems appropriate. Of course if the startup aims to high it risks that there is not enough investor demand and the funding fails. How to get started as an investor? I just signed up online and submitted some documents to verify my identity. The process is pretty straightforward. Seedrs is open to international investors, so investors do not have to be UK residents. After signing up, investors can browse the pitches that are currently raising money. A pitch is usually open for 60 days, but maybe closed early by the startup if the goal is reached earlier. Clicking on any one of the pitches reveals the detailed information. It also shows who has invested and how much. Investors can opt to show their bid as ‘Anonymous’ in order not to disclose thier name to the Seedrs community. When an investor likes a pitch bidding is possible through the “Invest” button. As long as the pitch is below 100% funding an investor can bid first, and pay later (within 7 days of the pitch completing 100% funding). Once the pitch reaches over 100% it is marked as “overfunding” and investors can only bid, if they have already deposited funds available in their account. Payment is possible via bank transfer or credit card. Seedrs completes all the paperwork with the startup. As Seedrs acts as a nominee for investors the individual investor does not have to do anything. The nominee structure means that the startup does not have to deal with each of the many individual investors but rather only with Seedrs as Seedrs represents all of these investors. 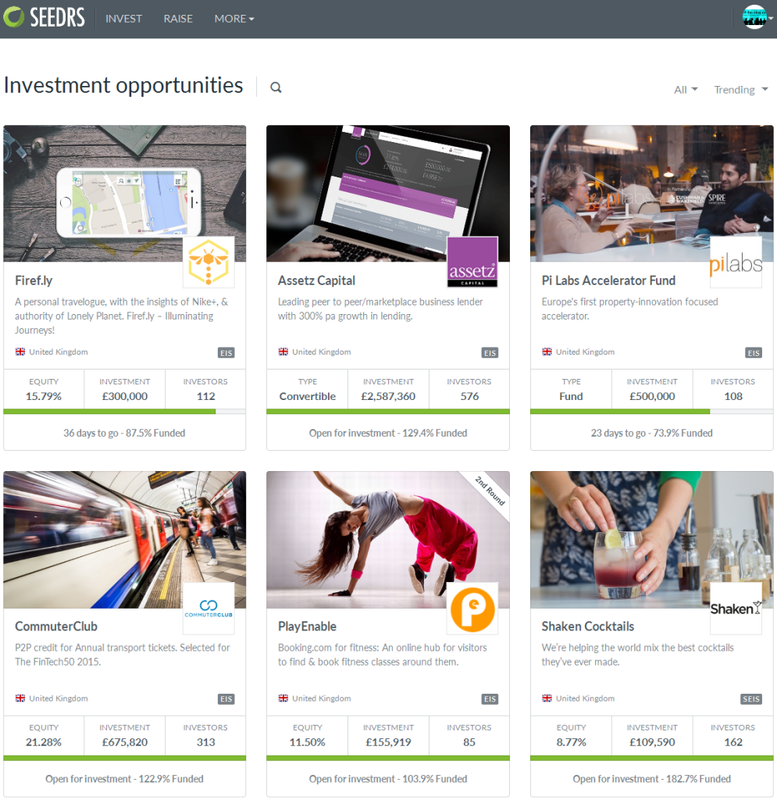 Seedrs charges the investors a fee of 7.5% on the profits the investors make (note that this is not a fee on the investment amount (example: an investor invests 200 GBP in a pitch. Should there be an exit later where the value of the investors shares is now 300 GBP then Seedrs charges 7.5% of the 100 GBP profit; therefore the investor would be paid back 292.50 GBP). Note that your investment will be illiquid until the exit; as there are restrictions on selling the shares. After the funding is completed the startup can communicate updates to the investors on how they are progressing. There are huge differences in how often the startups I invested in use this communication channel. Some post updates about once per quarter other rarely inform about the status. If a startup is eligible for EIS or SEIS then it is shown in the pitch. This can mean huge advantages for British residents, depending on circumstances. To get advice contact a qualified and certified tax advisor. I concentrated on fintech startups and invested larger amounts in startups operating in the p2p lending space that interests me most. But I also invested small amounts – often 10 GBP in other startups that had interesting ideas just to keep informed how the develop. Sometime startups that are successful are doing second and further follow up rounds on Seedrs to raise more capital for their growth strategy. In this case all Seedrs investors from the earlier rounds have pre-emption rights. That means they are offered to invest in the new round in order to avoid being diluted (example if an investor held 0.05% of shares in a startup after the first Seedrs round, he will be offered to invest in reserved shares in the second round. Buying those will allow him maintain his share percent at 0.05%). Naturally the video, idea and market description of the startup paint a very positive picture of the situation and the future outlook. I therefore like the possibility to ask the startup questions and to read the questions and answers from others. Use button to ask question. Left button is public; right button is for private questions – request to be sent the business plan here. Sometimes startups are funding so fast that first depositing via bank transfer and then bidding is not viable. I liked that I could bid first (not in overfunding) and pay later. While I have used several other equity crowdfunding sites, at the moment Seedrs is my preferred platform. The process is smooth, I only once needed support and at that time the response was prompt. I am especially impressed by the progress of Landbay, which I invested in through Seedrs and which has raised multiple rounds meanwhile. Though it’s probably too soon to ask, but still: have you seen any exits in your portfolio? Also I’m interested about taxation, maybe you have some information if ‘foreign’ investors has to pay any tax on UK, or is the situation like in Estonia where all investors pay accoringly to their own country? Am I right if the min bid is 10 pounds in Seedrs? no exits so far – at least none in my portfolio. Yes, minimum bid is usually 10 pounds, although on second or later rounds it may be a bit higher. I cannot give tax advice.